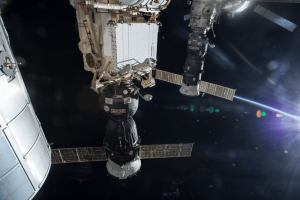 The Progress 59 cargo craft, and unmanned Russian spacecraft, successfully launched on April 28th on a resupply mission to the International Space Station. Unfortunately, on its way to the ISS, the cargo craft broke into a dizzying free-fall just after reaching orbit and detaching from its booster rockets. Russian officials have confirmed that the craft is out of control, meaning approximately 6,000 pounds of fuel, food, medical supplies, and spare parts will not make it to the six-person crew aboard the ISS. Luckily, the astronauts are not in danger of running out of provisions before the next resupply mission, according to NASA. An official from Roscosmos (Russia’s space agency) expects the debris from Progress 59 to fall to the ground sometime between the 7th and 11th of May.